As whole, the ecommerce industry is ANTIQUATED. It's out of date! and is way way way behind in terms of what's actually working in the world of online business. Most ecommerce business owners are still doing things in the same way they were done back in the early dot com days. And that my friend is a recipe for disaster. There is SO much more to ecommerce than building a store, filling it with products and driving some traffic. If that describes you and your business, then let this be your wake up call! There is a transformative shift happening in the ecommerce industry right now. What worked before is either no longer an option or is rapidly losing its effectiveness. It's time for you as an ecommerce entrepreneur to evolve your brand, your business and your brain. THIS BOOK, Is the playbook for capitalizing on this evolution. Ecommerce Evolved contains a simple, repeatable and proven formula to help you build, grow and scale a wildly profitable ecommerce business in today's competitive market. You will find Zero Theory inside this book. Tanner Larsson has distilled years of research & practical in-the-trenches ecommerce experience into a hard hitting ecommerce blueprint. The book is broken up into 4 distinct parts and each part is then broken down into a number of focused chapters. The book kicks off with the 12 Principles of Ecommerce that have been developed after working with over 10,000 different businesses. These 12 principles...of which we can almost guarantee you are violating over half of...are what differentiate the thriving ecommerce businesses from the mediocre ones. Part 1 which is called Evolved Strategy and is where we pull back the curtain, take you behind the scenes, and show you how 7, 8 and 9 figure ecommerce businesses really work. Part 2 is called Evolved Intelligence and deals with the most underutilized aspect of most ecommerce businesses...your Data. Part 3 is called Evolved Marketing. In this section you will learn how to leverage the your business's structure and data to build create systematic and highly automated marketing campaigns for both the front end and back end of your business that produce massive return on investment. Ecommerce Evolved takes you through the exact same processes I take my high level clients through as we restructure their businesses for maximum growth, profitability and most importantly longevity. As an added benefit... Ecommerce evolved is also the key that will unlock access to my private ecommerce community. This is an up till now secret group of ecommerce professionals where we talk shop, strategize and grow our businesses through the collective genius of the group. This book is literally the step-by-step blueprint to building a successful and highly profitable ecommerce business and the private community is the support group that will help you along the way. 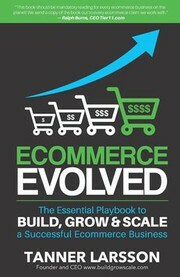 ecommerce evolved PDF is available as a free download.